As this morning’s edition of the Weekly Briefing argues, the nomination of Brett Kavanaugh to the U.S. Supreme Court must be resisted. In area after area, a Justice Kavanaugh would transform a conservative Supreme Court into a truly reactionary Supreme Court. 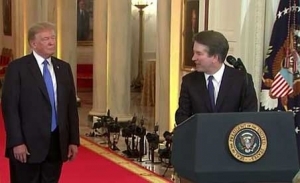 “After near constant promises that he would only appoint Supreme Court nominees that would overturn and gut Roe v. Wade and criminalize abortion, President Trump has held true to that promise with the nomination of Judge Kavanaugh. Kavanaugh recently argued that a young woman, despite meeting all of Texas’ burdensome requirements to obtain an abortion, should not be able to do so. He has also been a long-time conservative activist working to elect anti-choice politicians. Stay tuned to NC Policy Watch for further updates on the battle over the Kavanaugh nomination.